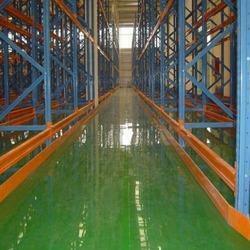 Epoxy Coatings create a healthy, congenial and dust free work environment. Epoxy Flooring help protect industrial floors against further damage and degeneration due to abrasion, chemical corrosion and wear and tear especially due to vehicular loads.Only the best quality Epoxy Resin, Fillers and Curing Agents are used, which are applied by a team of skilled applicators. Dubond’s Dupoxy Coating TCS- l00 is Epoxy Coating is a three-component high solids, epoxy resin coating system supplied in pre- weighed packs ready for on-site mixing and use.The cured film forms a hard, smooth finish, joint less, non porous, hygienic, durable, coating with excellent adhesion to clean concrete, sand/cement and granolithic screeds, and certain metal surfaces. It cures to semi-gloss impervious finish which is easily cleaned.The product is available in a(RAL)colours and is also available in a clear grade. It is essential that Dupoxy Coating TCS- 100 is applied to sound, clean and dry substrates in order to achieve maximum adhesion.Because Dupoxy Coating TCS— 100 is a relatively thin coating, the substrate must be fine textured. Any surface irregularities may show through causing excessive wear on high spots and changing the perceived colour of coating.New Concrete Floors Unless otherwise agreed by the engineer the floor should have been placed for at least 28 days and have a moisture content of less than 5%. Floors should be sound and free from contamination such as oil and grease, mortar and paint splashes or curing compound residues. Excessive laitance can be removed by the use of mechanical methods. Dust and other debris should then be removed by vacuum cleaning.Old Concrete Floors A sound, clean substrate is essential to achieve maximum adhesion. Oil and grease penetration should be removed by the use of A proprietary chemical degreaser or by hot compressed air treatment.Any damaged areas or surface irregularities should be repaired using Dupoxy SL—200 & Dupoxy Putty.Steel Substrates Steel substrates should be grit blasted to surface quality SA 2.5 (BS 4232 : Second Quality) and primed with a single coat of Dupoxy Prime SFD.Epoxy Screeds Dupoxy Coating TCS- 100 can be applied to Epoxy Resin screeds. High spots or trowel marks should be rubbed down and dust and other debris removed by vacuum cleaning. High resistance to chemical attack is required . Workshops / Warehouses.Dairies / Food Processing Unit Soft drinks production and bottling plants. Light Industrial Plants.Showrooms / Hospital / Hotels. High resistance of awide range of industrial chemicals. Impervious finish provides easily cleaned surface. Available in a range of colours to improve the working environment. Dubond’s Dupoxy Coating TC- 100 is a solvent free system based on epoxy resins and curing agents specially selected for their ability to withstand chemical attack. The system consists of pre- weighed base & hardener components and a Dupoxy colour pack, all of which contain reactive elements that are essential to the installation of the system.A slip resistant texture can be provided by the use of one of a range of Dubond Anti slip Grains which have been carefully graded to ensure an even texture. Light Industrial Plants. Showrooms / Hospital / Hotels. Proven against a wide range of industrial chemicals. Solvent free - no odour during application. Slip resistant - different textures available to suit conditions to avoid slipping. Liquid applied providing complete protection. Available in a wide range of colours to improve the working environment and identify slip hazard areas.